Date seal: 1852, 2nd mo. "First produced in Kyoto in 1780, the kabuki play Stories Heard in the Pleasure Quarter at Mirror Mountain (Kagamiyama sato no kikigaki) was loosely based on a power struggle that had taken place some thirty years earlier in the Kaga domain, the hereditary fief of the Maeda family, when an ambitious retainer killed Lord Maeda Yoshitoku and his three sons to further his own schemes. As usual in kabuki plays, the names and setting are changed , so that the plot deals with the troubles of the 'Yasuda' family of 'Taga': but the real basis of the story, the Kaga incident, is concealed in the place-name Mirror Mountain (Kagamiyama), which also features in the titles of other plays on the subject. In the plays, Torii Matasuke is a loyal retainer of Lord Yasuda of Taga, but he is tricked by the evil Mochizuki Genzō (based on the real-life villain Ōtsuki Denzō). 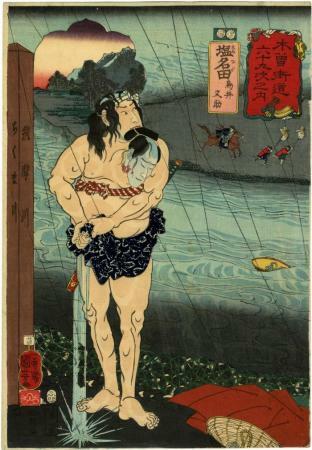 In a rainstorm, the lord is crossing the Chikuma River on horseback when Matasuke, swimming underwater, surprises him and cuts off his head. Clutching his gory trophy in his teeth, Matasuke wrings out his soaked clothing as the lord's retainers dash about in confusion on the far shore. Only too late does he learn that he has killed the wrong person, not the villain he thought he was attacking but his own lord. Stirrups and other horse trappings frame the series title border. The eight-petaled floral medallion that outlines the inset landscape is a shape sometimes used for bronze mirrors and so may allude to the place-name, 'Mirror Mountain' in the plays. The Chikuma River, clearly identified by the signpost at the left, is a real river that runs near Shinoda station, although it is spelled with different characters in the play." Quoted from: Utagawa Kuniyoshi: The Sixty-nine Stations of the Kisokaidō by Sarah E. Thompson, p. 64. Shionata, on the eastern shore of the Chikuma River, was the only stage in the province of Shinshu where travellers often met with interruptions of ferry service. The river ran broad here, and travellers had to be ferried across it. A beauty spot here was the Fudo Fall with abundant clear water, where worn-out travellers had a moment of relaxation.